Good morning ... Situational awareness: Rep. Jacky Rosen, Sen. Dean Heller's opponent in the midterm elections in Nevada, introduced a resolution last night to get the House to defend the Affordable Care Act's protections for people with pre-existing conditions in court. State-level Democrats are already a party to the lawsuit. So the substance of this step may be less significant than the fact that Heller's opponent is introducing it, a few days before the anniversary of last year's final, failed repeal vote. Go deeper: The entire S&P 500 — in an interactive graphic. Medicare proposed two significant steps yesterday to cut hospital spending by hundreds of millions of dollars. Driving the news: Most significantly, the Centers for Medicare & Medicaid Services proposed expanding a policy that calls for "site-neutral" payments. 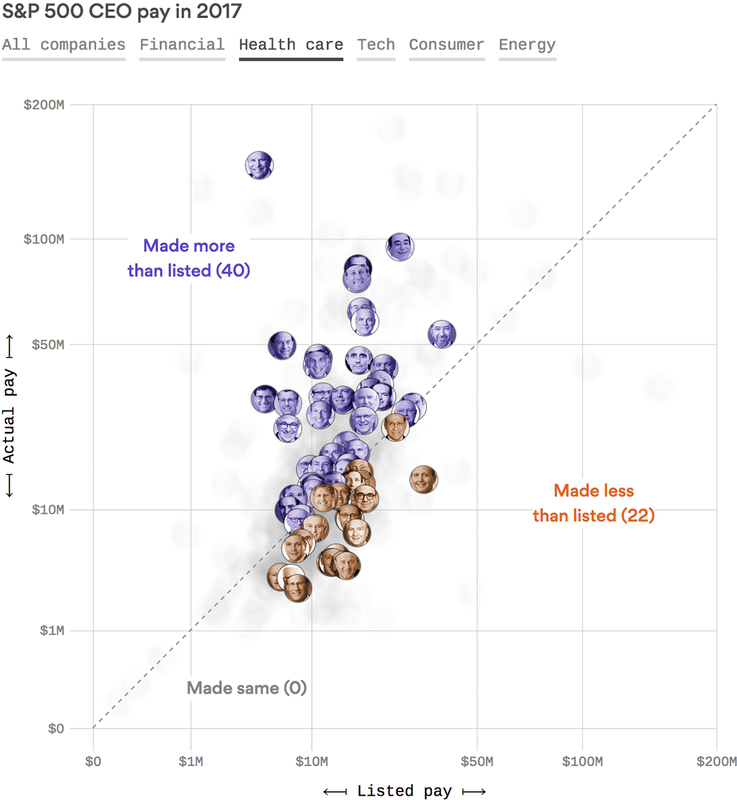 Medicare pays hospitals a higher rate than doctors' offices. Hospitals are increasingly buying up doctors' offices, which perform the same services but now bill as part of a hospital — and therefore make a lot more money. "Site-neutral" payment means a particular service gets reimbursed at a prescribed rate, no matter where it's performed. CMS' new payment proposals would make clinic visits, which the agency described as "essentially check-ups," site-neutral. It said that change would save the Medicare program and Medicare recipients a combined $760 million next year. CMS also wants to further scale back the 340B program, which allows hospitals to buy some drugs at a discount. It cut the program significantly last year, and says its latest proposal would save as much as $48.5 million. Why it matters: These proposals aren't necessarily headline-grabbing, but will touch off a fierce lobbying blitz, especially from hospitals. But speaking of headline-grabbing debates, CMS Administrator Seema Verma took a couple digs at "Medicare for All" yesterday in a speech that otherwise focused on programmatic changes to the Medicare program. The highlights: "This notion reveals a fundamental lack of understanding about the uniqueness of Medicare ... Medicare for All would become Medicare for None ... By choosing a socialized system, you are giving the government complete control over the decisions pertaining to your care, or whether you receive care at all." It shouldn't surprise anyone that Verma is against "Medicare for All," though the proactive attack on an idea that's still largely undefined is kind of interesting from a political perspective. Young people have more medical debt than older people, even though they tend to spend much less on health care, according to a new study published in Health Affairs. "Medical debt," in this case, means an unpaid medical bill that has been referred to a collection agency. By the numbers: About 16% of consumers have an unpaid medical bill, the study says, adding up to roughly $81 billion. Most of those individual bills were for less than $600. The big picture: The top-line finding here is that people without health insurance are more likely to have outstanding medical bills. There's a direct correlation: The number of people with medical debt, and the size of that debt, were both bigger in areas with more uninsured people. Lower-income households also have more medical debt, as do younger people — two other factors that correlate with how likely you are to have insurance. 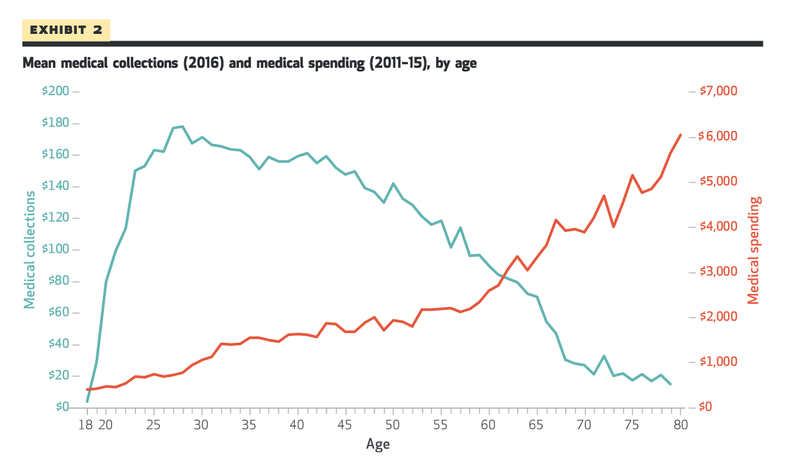 You can see in the chart above that medical debt all but disappears after age 65, when Medicare kicks in, even though seniors rack up the most health care bills overall. But insurance isn't a failsafe. Because most unpaid bills aren't catastrophically large, they're well within many people's deductibles. So, younger or lower-income people with high-deductible plans could still have to face a collection agency if they need to use their coverage. Add one more item to the list of false content Facebook won't do anything about: pages claiming that vaccines cause autism. They appear at or near the top of searches for "vaccines," the Daily Beast reports. Searches for vaccine information turn up groups with names like "Vaccines Exposed" and "The Truth About Vaccines," which have large followings and "often include memes claiming that doctors don’t learn enough about vaccines in medical school to be trusted." What they're saying: "A Facebook spokesperson told The Daily Beast it removes information that violates its community guidelines and allows users to tailor the information they see on the site ... But Facebook refused to comment on why it allows anti-vaccine hoaxes to spread on the site, or why it makes it so easy to find anti-vaxx groups through searches." A single bot flooded the Food and Drug Administration with at least 255,000 comments about how to regulate vaping. That's almost half the public feedback the FDA received, according to the Washington Examiner. The FDA had asked for public comments about flavored e-cigarette products. The comment period closed last week. One bot managed to submit 255,000 anti-vaping comments in just three days. They were identifiable because they repeated certain phrases, and officials were eventually able to isolate IP addresses the bot was using. Brent Stafford, the founder of Regulator Watch, the organization that first flagged the onslaught, told the Examiner there's a good chance at least 200,000 more comments are also fake. If the goal was to simulate a persuasive groundswell of public opinion, it probably won't work. “The comment process is not a vote — agencies make determinations for a proposed action based on sound reasoning and scientific evidence,” the FDA told the Examiner. What we're watching today: HHS Secretary Alex Azar speaks at the Heritage Foundation about free market principles in health care (11 am; livestream). Senate Democrats hold a news conference to mark the upcoming anniversary of repeal-and-replace. Energy and Commerce subcommittee hearing on Medicare's payment systems. What's up with you? I always welcome your tips and feedback: baker@axios.com.